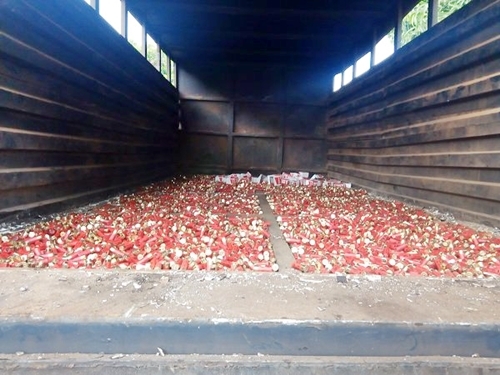 A Onitsha-bound truck loaded with 200,000 live ammunition which was being brought into the country from Benin Republic, has been intercepted by operatives of Nigeria Customs Service from Niger, Kwara, Kogi Command. 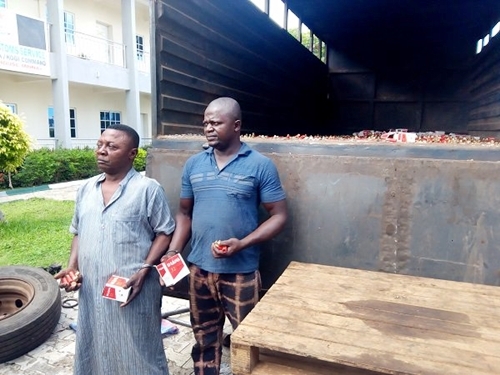 The two suspects identified as the driver, Bukari Dauda and the owner of the cartridges, Martin Anokwara, were apprehended along the Wawa-Babana border in Niger state with the Truck. While speaking to the press, the Command Controller, Comptroller Benjamin Binga said that his men intercepted the truck which entered the country through the Babana border at about 3a.m on Monday morning. “The cartridges are numbering thousands, it would take us hours to count it. We are now working to establish what the cartridges are really meant for and who sent them to bring it into the country." Meanwhile, the driver of the truck, Bukari Dauda said he is from Cotonu in Benin Republic and he was employed by the owner, Martin Anokwara to drive the truck for him to Onitsha. Dauda said that he did not know the truck contained live cartridges as Martin only told him he wanted to take the empty gericans back to Nigeria. The owner of the cartridges, Martin Anokwara confirmed that he is the owner of the cartridges just as he said that it is not meant for robbery, adding that he supplies hunters and licensed owners of double barrel guns, and that he only sells them in Anambra. Martin explained that the driver of the truck fell sick which made him contract Dauda to drive him back to Nigeria saying that they had entered the country before they were apprehended by the customs. The Customs Controller of the Niger, Kwara and Kogi Command said that they would be interrogated before they are charged to court.